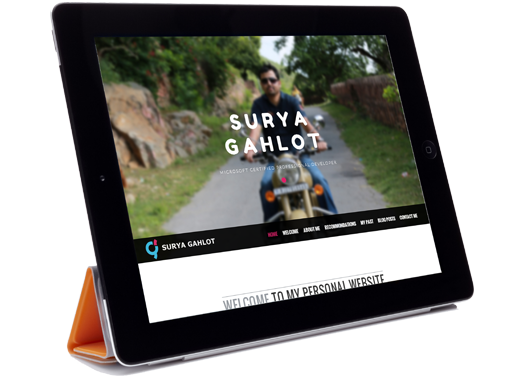 Welcome to Surya Gahlot's Personal Website! It gives me immense pleasure to welcome you to my website. And I would like to thank you for taking the time to walk through my website. I wish you a pleasant time in browsing my personal website. Looking forward to hearing your views and comments. Hi there! I'm Surya Gahlot. I am from Rajasthan, India. Initially, I desired to become a cinematographer / photographer / a technician in electronics and went to school. One thing led to another and years went by. And lo, now I am a full fledged software developer without ever planning to become one! So now, I'm a Microsoft Certified Professional Developer (MCPD), Sitecore Certified Professional Developer & Certified Scrum Master. I am working as a Software Solutions Architect in Jaipur (India). Professionally I have been programming for 12.10 years. I have a passion for Microsoft technologies, especially of web technologies. All my interests and hobbies are related to programming and photography. I love to challenge the complex problems and prove them to be simple. When I'm not coding, you'll find me browsing web. I always look for new challenges and new people to meet. I had the privilege of working with Surya at EF information systems limited. Surya is proactive, result oriented, responsible and technically sound person and he is always ready to put all his energy and time to get the job done. Surya is an extremely talented developer, with a consistent can-do attitude and he aims deliver high quality results at any assigned project. Surya is proactive, result oriented, responsible and technically sound employee and he is always ready to put all his energy and time to get the job done. He has an exceptional troubleshooting and analytical skill in Microsoft technologies. Surya is very passionate and has great vision for his work. He is highly creative and a very easy-going person to work with. His responses are timely, value-added, and he’s open to working with new people and mentored many junior resources in the team. Surya was an important contributor to many of our projects. He consistently delivered high quality work products, and always exceeded expectations. He respects the organizational processes and policies and religiously followed in all our projects. Hello, I still remember the uthak-baithak you did on the official trip few years back. Got good reports from STO team, under which you first started at Relyon. Glad to have you recommended into Saral TDSWeb team. You have been a great support in bringing out ideas for the web version. The framework laid out for this project is exceptional and to this day, any new member joining the team is at ease to understand it. You are any Project Manager/Leads dream-come-true. I find you have immense knowledge in Microsoft Technologies. Even more so, I find you being more a technical person willing to explore other technologies too. A very good subordinate and colleague is what I can end up saying. I enjoyed working with Mr. Surya. It is always good to work with people who are interested to complete assignments in time and that to with Appetite to learn new things and instantly adopt them. He helped us to build stable products. I appreciate his extraordinary efforts to bring up TDS modules, which is now implemented in many banks across India. EF is the world's largest private educational company. Working at EF is challenging, fun and of multicultural. Presently working at EF Academy and this is the first time I got a chance to work on a very powerful CMS Sitecore and now I am a Sitecore Certified Professional Developer. Photography is one of my hobbies. There is nothing more enjoyable than capturing pictures of wonderful moments and images and sharing them with others. This was the reason to buy a very professional full frame camera - CANON 5D MARK III and enjoy the weekends. I had the opportunity to work for France based company named Cegedim. I worked on a very beautiful and huge product "Mobile Intelligence (MI)". It is a comprehensive, Web-enabled product suite that improves communications, optimizes promotional activities, and streamlines new product launches of pharmaceutical companies. I got a chance to work on "Route Builder" module for iPad version of MI. This was the time when I planned to have more interaction with outer world, so created a technical blog and named it as MSCoder. Though it was limited to Microsoft Technology but got a very good response. Working with Relyon was very challenging and exciting. Had an opportunity to work on a very first web product of Relyon called "SaralTDS Web". I played a very significant role. I was involved in designing the architecture, coding, code reviewing & db designing. I had very low level understanding of the product architecture. During this period, I worked on 2 major products called Saral Account and Saral Office. I worked on TDS module of Saral Accounts and I was a Lead Developer for "Balance Sheet" & "Service Tax" module of Saral Office. This was my first job in Bangalore. I was new to Bangalore city but after joining Relyon I was so comfortable as co-workers have been so friendly and supportive. I have made lots of new friends :). My first assignment was a product named ROC (Registrar of Companies). This product was to file ROC returns. I moved from Rajasthan to Bangalore. I was scouting for a job and had lots of free time. So, planned to work on something new. Suddenly I sported an idea to create website for "Love". Finally that idea turned into a Lovemeter website. This was my first website. Along with this website I created one more website just to play with web stuff. I would like to thank company Brinkster for providing free webhosting. After completing Masters, I got an opportunity to work as a freelancer for a stock broker. I worked on a product called EasyMan. This product was very helpful for them. It was an accounting application which helped them to manage their client accounts with brokerage slab calculations and to generate different types of reports. I enjoyed working on VB 6.0. I used to spend more than 18 hrs a day just doing VB coding. Doing M.Sc. (Computer Science) was a coincidence. In fact I was never interested in studies. The area where from I have come is very backward. There was no college to study Computer Science. That was the reason I had to do part time degree from far off city called "Bikaner". I had worked as a trading operator for stock broker firms Hinglaj Investment & Mataji Investment for 1.4 years. I got an oportunity to learn lots of things about major indian exchanges - BSE, NSE, NSE Future & Options, NCDX & MCX. I also worked as a Data Entry Operator for Income Tax department for more than a year. I learnt about Income Tax rules & regulations. Besides my studies I was busy doing few other things too and Photography was one of them. I bought my first professional film camera Cosina and for videography I used to borrow panasonic M1000 and M3500. I've been a great fan of electronic gadgets. I use to disassemble electronic gadgets and look inside it before even playing with the gadget. This led me to become a electronic technician. I had worked at a repairing shop and I used to repair B/W TV, Radio & Tape Recorder. Later I started assembling B/W TV by self and sell it in nearby village. Please feel free to contact me for any questions, suggestions, job offers, or to tell me your secrets, or just to say "hi"
2019 © SuryaGahlot.com, All rights reserved.